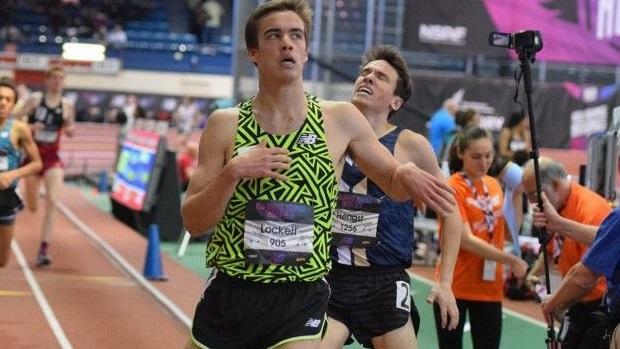 Missed any of the action at this year's New Balance Indoor Nationals. Don't worry - we've got a quick rundown of all of the best Maryland performances from this past weekend. One Mile: It was a showdown between Poolesville's Ryan Lockett and Dalton Hengst, formerly of McDonogh, that gave Maryland fans one of the best races of the weekend. Neither Lockett nor Hengst was fazed by the competition and both turned in season bests - Lockett second (4:08.82) and Hengst third (4:09.10). In terms of MileSplit MD's database dating back to 2000, only Hengst and Broadneck's Matthew Centrowitz have run faster in the 1600/mile indoors. 200: Bullis senior Eric Allen, Jr. wrapped up a spectacular season with a second-place finish in the 200 meter dash finals. His time of 21.08 was just 0.07 seconds behind the winner, Pennsylvania's Austin Kratz. 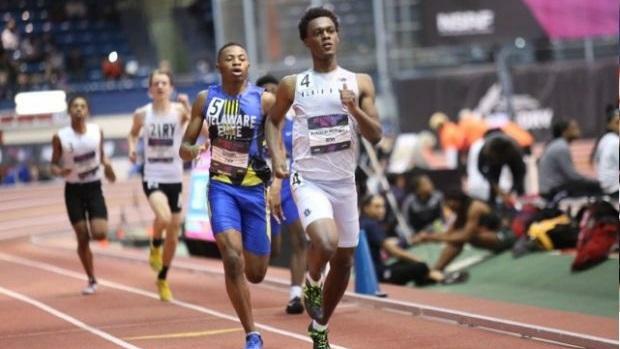 Allen still owns the top 200 indoor time in MileSplit MD's database. 400: He was disqualified in the finals, but junior Nick Wilson ran an indoor personal best of 48.31 to place sixth in the prelims. It is the second-fastest time in the state this season behind Eric Allen, and the seventh-fastest in MileSplit MD's database. 4x200: Both Bullis and DeMatha have built dominant sprint relays this winter, and they were on full display this weekend up at the Armory. They went 1-3, respectively, in the prelims of the 4x200, before finishing second and third in the finals. 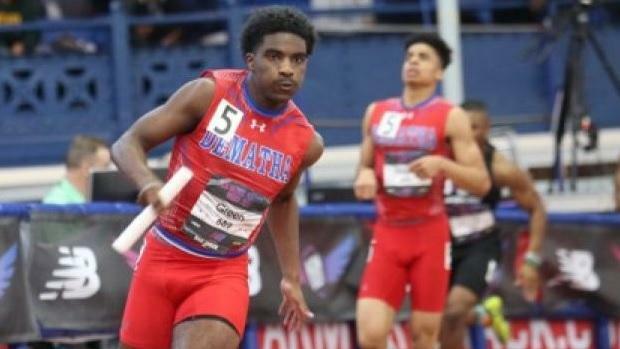 Bullis and DeMatha ran the top two 4x200 times in MileSplit's database, and Bullis' 1:26.77 performance from the prelims ranks third all-time in the nationwide database. 60: The DeMatha boys featured not one, but two sprinters in the finals of the 60 meter dash. Brendon Stewart and Nick Cross finished sixth and eighth, respectively, in the finals after advancing through both the prelims and semifinals. 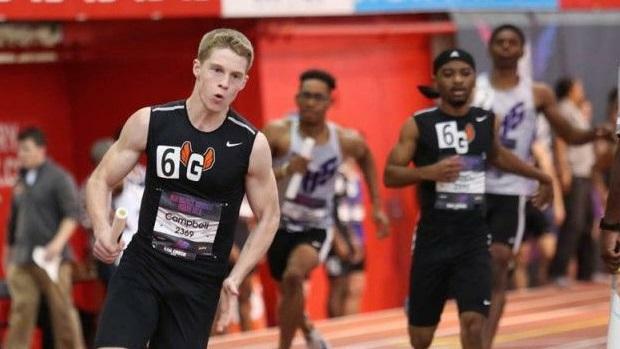 Neither of them ran season bests, however: they ran 6.66 and 6.68 at the Marshall University High School Open in February, performances that convert to 6.21 and 6.23, respectively. Those converted 55 meter times are two of the top four in MileSplit MD's database. 60 Hurdles: South Hagerstown's Andre Turay was the only Maryland competitor to advance through to the finals, where he finished fourth in 7.83 (which converts to 7.30 for 55 meters). That ranks him as the fourth-fastest indoor hurdler in the database, just in front of Daniel Whitfield, who made it to the semifinals. High Jump: The South Hagerstown pair of Kaithon McDonald and Nathaniel Moore were Maryland's top representatives in the event at indoor nationals, finishing with heights of 6'7 and 6'5, respectively. One Mile: Richard Montgomery sophomore Garrett Suhr finished third (4:19.91), one year after winning the freshman mile at indoor nationals. Mount St. Joseph senior Hunter Petrik placed 11th, just two seconds behind at 4:21.60. SMR: The Reservoir boys finished third in the Emerging Elite sprint medley relay, anchored by a 1:57.52 800 split from two-time 3A state champion Kai Muniz. Their time of 3:34.39 ranks fifth in MileSplit MD's database (dating back to 2000). Two Mile: Loyola-Blakefield junior Camden Gilmore turned in a huge personal best in the Emerging Elite two mile, finishing fourth in a personal best time of 9:23.95. The effort catapulted him to the top of the state 3200/two mile leaderboard. Fellow junior Garrison Clark (Severna Park) finished right on his heels in 9:25.89. 400: Indoor 500 state champions Aariq Nixon (Milford Mill) and Eldon Phillips (Northwood) represented Maryland with top-ten finishes. Their respective times of 49.35 and 49.62 ranked them fifth and sixth on the Maryland 400 leaderboard for the indoor season. 4x200: The Gators of Reservoir weren't just third-place finishers in the sprint medley relay, but they also took home silver in the Emerging Elite 4x200. Only three Maryland teams ran faster than their 1:30.35 effort this season. 4x400: It wasn't quite their fastest performance of the season, but the McDonogh boys placed fifth in the Emerging Elite 4x400 with a time of 3:27.38. 60 Hurdles: Flowers' Brandon Tunson and La Plata's Alex Strong faced off in a battle of state champions during the finals of this year's Emerging Elite 60 meter hurdles. After Strong edged Tunson by a hundredth of a second in the prelims, the Flowers senior came back strong for the finals, crossing the line in third place. His 8.02 performance was good for ninth in MileSplit MD's database dating back to 2000. Shot Put: Broadneck senior Elian Ahmar capped off his perfect indoor season by setting a new Emerging Elite meet record in the shot put. You can read more about his outstanding performance here. Triple Jump: Two Maryland athletes cleared 46 feet in the Emerging Elite triple jump this weekend. Loyola-Blakefield's Ty Trinh finished fourth (46'3.25) and Northwest's Clarence Foot-Talley finished sixth (46'1.50). 400: Bullis freshman Sebastian Antoine-Pompey placed third in the 400 at 52.29. Both St. Vincent Pallotti's Carl Hicks (52.42) and Calvert Hall's Ryan Moore (52.89) finished in the top ten, as well. 60: Pallotti's Carl Hicks was busy this weekend, as he also finished fourth in the freshman 60 meter dash in 7.15 (converting to 6.66). DeMatha's Kenny Dudley - who has the top freshman 55/60 meter dash time in Maryland this winter - finished right behind in fifth place.